Texas A&M University and the University of Texas at Austin may be former football rivals, but the Lone Star State's two research giants have teamed up to detect the most distant spectroscopically confirmed galaxy ever found—one created within 700 million years after the Big Bang. "It's exciting to know we're the first people in the world to see this," said Vithal Tilvi, a Texas A&M postdoctoral research associate and co-author of the paper, set to be available online after Oct. 24. "It raises interesting questions about the origins and the evolution of the universe." "Because of its distance we get a glimpse of conditions when the universe was only about 700 million years old—only 5 percent of its current age of 13.8 billion years," said Papovich, an associate professor in the Department of Physics and Astronomy and a member of the George P. and Cynthia Woods Mitchell Institute for Fundamental Physics and Astronomy since 2008. "We were thrilled to see this galaxy," Finkelstein said. "And then our next thought was, 'Why did we not see anything else? We're using the best instrument on the best telescope with the best galaxy sample. We had the best weather—it was gorgeous. And still, we only saw this emission line from one of our sample of 43 observed galaxies, when we expected to see around six. What's going on?'" Tilvi notes this is one of two major changes in the fundamental essence of the universe since its beginning—the other being a transition from a plasma state to a neutral state. He is leading the effort on a follow-up paper that will use a sophisticated statistical analysis to explore that transition further. This is an artist's rendition of the newly discovered most distant galaxy z8_GND_5296. (The galaxy looks red in the actual Hubble Space Telescope image because the collective blue light from stars get shifted toward redder colors due to the expansion of the universe and its large distance from Earth.) Credit: V. Tilvi, S.L. Finkelstein, C. Papovich, NASA, ESA, A. Aloisi, The Hubble Heritage, HST, STScI, and AURA. 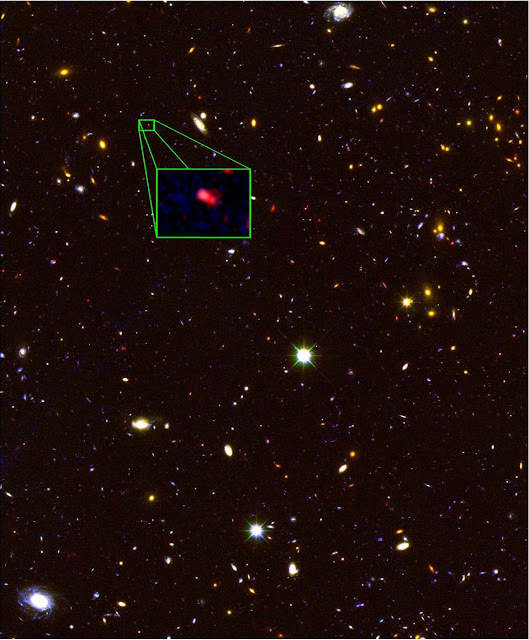 They detected only one galaxy during their two nights of observation at Keck, but it turned out to be the most distant ever confirmed. It was at a redshift 7.51—or created about 13 billion years ago. 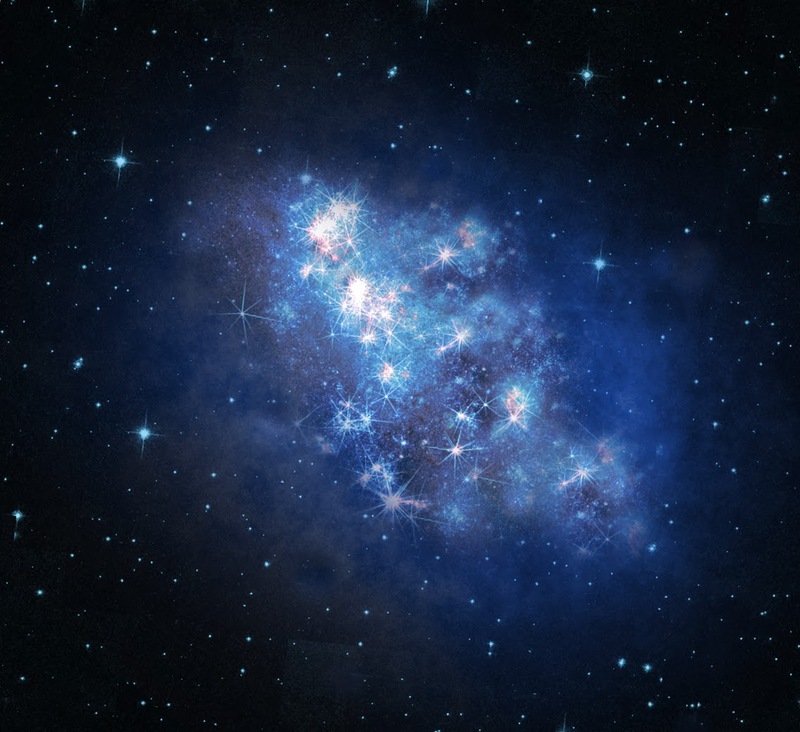 Because the universe is expanding, the space between galaxies also is increasing. And as objects move away, they become redder. In essence, the higher the redshift, the farther away the object. Only five other galaxies have ever been confirmed to have a redshift greater than 7, with the previous high being 7.215.